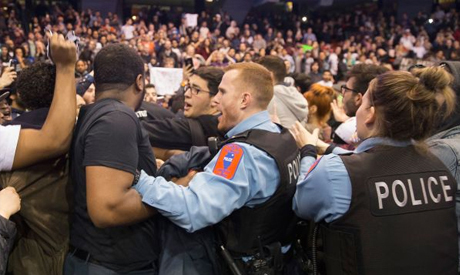 Donald Trump cancelled a rally in Chicago Friday in the face of huge protests, which triggered scenes of chaos and prompted his presidential rivals to blame the violent outbreak on his incendiary rhetoric. Demonstrators scuffled with the Republican presidential frontrunner's supporters and police struggled to maintain order, with hundreds of protesters showing up for the event. The billionaire said he decided to call off the rally after consulting with police in the city, where tensions had been rising for hours in the build-up to the event at a sporting arena at the University of Illinois at Chicago. "I don't want to see anybody hurt," Trump told CNN afterwards. "I think we made the right decision (to cancel)... even though our freedom of speech was violated." Throngs of protesters, many of them blacks and Latinos angered by Trump's incendiary anti-immigrant rhetoric, had massed outside and inside the venue itself, mingling with the candidate's supporters. Pundits said the chaos at the rally was reminiscent of violent protests at the 1968 Democratic national convention, also in Chicago, held when the United States was torn apart by opposing views on the Vietnam War. CNN estimated there were between 8,500 to 10,000 people in the arena when tensions erupted into chaos. According to an AFP photographer at the scene, scuffles broke out as the decision to cancel was announced, with police struggling to separate angry supporters and protesters. The chaos ended several hours later, but not before members of the crowd threw bottles and other objects at officers, and some tried to take the stage and speak at the podium. In addition to Black Lives Matter supporters, some protesters carried Bernie Sanders campaign signs and chanted the Democratic presidential candidate's name. One sign held by a protester inside the arena said "We are not rapists," referring to Trump's characterization last year of Mexicans as rapists. Police made a total of five arrests and two officers were taken to area hospitals after sustaining minor injuries, the Chicago Police Department confirmed to AFP. Critics have accused Trump of fueling the toxic atmosphere. On February 1, as protesters interrupted a rally in Iowa, he encouraged supporters to "knock the crap out of them," and pledged to pay their legal fees. When a protester disrupted Trump's speech in Las Vegas, the brash billionaire said he would like to "punch him in the face." Trump dismissed the notion that he was responsible for whipping up tensions. In a statement, Trump's campaign said he had determined that "for the safety of all of the tens of thousands of people that have gathered in and around the arena, tonight's rally will be postponed to another date." "Please go in peace," it added. Trump's rivals framed the outbreak as at least partially caused by the frontrunner's incendiary rhetoric. "When you have a presidential candidate going into rallies and basically telling his followers 'you know, in the good ol' days people who (interrupted) leave on stretchers,' I think he should own up to that and take some responsibility," Republican rival Marco Rubio told CNN. Candidate John Kasich, also a Republican, said that "the seeds of division that Donald Trump has been sowing this whole campaign finally bore fruit, and it was ugly." The chaotic scenes come just days before the states of Florida, Ohio, Illinois and Missouri vote in the party primaries on March 15. The sudden security concerns mark a major test for Trump as he seeks to lock up the nomination and turn his attention to doing battle against Hillary Clinton, the Democratic frontrunner. Clinton was quick to take a stab at Trump over the Chicago violence, releasing a statement late Friday in which she said "we all have our differences, and we know many people across the country feel angry. We need to address that anger together." After rattling the Republican establishment with his shock emergence as the man to beat, Trump has been working hard in recent days to look presidential and shake off the brash, belligerent image. But Trump's rallies are known for being rambunctious affairs, and that seeped over into violence on Wednesday night in North Carolina when a 78-year-old white man in a cowboy hat punched a black protester in the face. John McGraw, who later said that next time "we might have to kill him," was charged with assault, battery and disorderly conduct for the sucker-punch. Asked on CNN, after calm was restored in Chicago, whether he regretted his comments about protesters, or bore some responsibility for whipping up tensions, Trump refuted the notion. "No, I don't regret it at all," he said. "Overall I think we've been very mild with protesters." Trump, who is scheduled to hold a rally Saturday in Cleveland, Ohio, has called on Republicans to amass behind him to propel him into the White House. On Friday he received a major boost, winning the endorsement of Ben Carson, the retired neurosurgeon who quit the presidential race last week. Many in the party see next Tuesday's votes as the last best chance to derail the insurgent candidacy of the billionaire mogul, who has so far won 15 of 24 primary races.